The 2008 Atlanta tornado outbreak was a tornado outbreak that affected the Southeastern United States on March 14–15, 2008. A tornado caused widespread damage across downtown Atlanta, including to the CNN Center and to the Georgia Dome, where the 2008 SEC Men's Basketball Tournament was postponed. 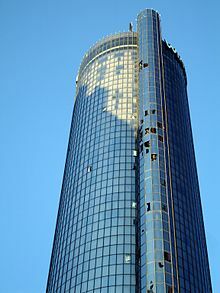 Other buildings that were damaged include the Georgia World Congress Center, Philips Arena (during an Atlanta Hawks game), and the Omni Hotel, which was evacuated after many windows were blown out. The Westin Peachtree Plaza suffered major window damage. The image of the building with all the windows blown out became famous and, for a time, was the symbol of the tornado. Centennial Olympic Park, SunTrust Plaza and historic Oakland Cemetery were also damaged. One man was killed near downtown Atlanta and 30 others were injured. Two other deaths took place on March 15 in the northern Atlanta suburbs from the second, larger round of severe weather and tornadoes. In total, 45 tornadoes were confirmed over the 24-hour period from eastern Alabama to the Carolina coast, with most of the activity concentrated in the Metropolitan Atlanta area, the Central Savannah River Area and the Midlands of South Carolina. In their 9:00 pm EDT outlook, the Storm Prediction Center issued a slight risk of severe weather across portions of the southern United States from Oklahoma to Georgia, with a 2% risk area for tornadoes for the Atlanta area. A tornado warning was issued for Atlanta at 9:26 pm when the thunderstorm that caused the tornado was 6 miles (10 km) northwest of downtown area, although no watches were in effect for the area due to the low probability and unusual isolated nature. The tornado moved to the southeast, which is unusual as most supercells have a strong northward component along (or ahead of) a cold front. It also was unusual because it was not associated with such a squall line at all, but was an independent supercell well ahead of the main storm system. Another tornado outbreak struck the southeast the following day. A moderate risk for severe storms was issued early in the morning, and maintained through the afternoon. However, by mid afternoon, areas of east-central Georgia and central South Carolina were upgraded to a high risk of severe storms due to the tornado threat. EF2 SE of Oneonta Blount 33°53′N 86°25′W﻿ / ﻿33.89°N 86.42°W﻿ / 33.89; -86.42﻿ (Highland Lake, AL) 1450 6 miles (9.7 km) 25 houses sustained major damage and many others had minor damage. One mobile home and many farm buildings and outbuildings were destroyed, killing many animals. EF2 NE of Pleasant Gap Cherokee 34°01′N 85°29′W﻿ / ﻿34.02°N 85.48°W﻿ / 34.02; -85.48﻿ (Pleasant Gap, AL) 1600 3 miles (4.8 km) Major damage to a roof of a house and a barn, as well as snapped pine trees. EF3 Aragon area Polk, Floyd, Bartow 34°06′N 85°07′W﻿ / ﻿34.10°N 85.12°W﻿ / 34.10; -85.12﻿ (Aragon, GA) 1625 16 miles (26 km) 2 deaths - Large wedge tornado destroyed at least 20 houses and damaged hundreds of others. Thousands of trees were knocked down across three counties. Two others were injured. EF0 Franklin Springs area Franklin, Hart 34°17′N 83°09′W﻿ / ﻿34.28°N 83.15°W﻿ / 34.28; -83.15﻿ (Franklin Springs, GA) 1844 3 miles (4.8 km) Tornado confirmed with widespread damage to trees and power lines. Major damage to a couple of houses and cattle barns. EF1 NE of Gill Lincoln, McCormick (SC) 33°34′N 82°21′W﻿ / ﻿33.57°N 82.35°W﻿ / 33.57; -82.35﻿ (Gill, GA) 2015 16 miles (26 km) Many trees were knocked down. EF2 SE of Fortsonia Elbert 33°59′N 82°45′W﻿ / ﻿33.99°N 82.75°W﻿ / 33.99; -82.75﻿ (Fortsonia, GA) 2019 7.3 miles (11.7 km) Damage reported to several structures, including a roof blown off a house and a boat dock thrown in the air in Bobby Brown State Park. EF1 N of Winfield McDuffie, Columbia 33°22′N 82°14′W﻿ / ﻿33.36°N 82.24°W﻿ / 33.36; -82.24﻿ (Winfield, GA) 2148 8 miles (13 km) One mobile home was destroyed and several others damaged. Many trees were knocked down. Two people were injured. EF0 W of Jackson Butts 33°17′N 84°05′W﻿ / ﻿33.29°N 84.08°W﻿ / 33.29; -84.08﻿ (Matthews, GA) 2215 3.25 miles (5 km) A barn was destroyed and numerous trees were knocked down. EF2 Matthews area Jefferson, Burke 33°13′N 82°19′W﻿ / ﻿33.21°N 82.31°W﻿ / 33.21; -82.31﻿ (Matthews, GA) 2215 19 miles (31 km) Several mobile homes were destroyed and numerous houses were damaged, some by fallen trees. EF1 SE of Waynesboro Burke 33°08′N 81°53′W﻿ / ﻿33.13°N 81.89°W﻿ / 33.13; -81.89﻿ (Waynesboro, GA) 2305 15 miles (24 km) One house sustained moderate damage to the roof, windows and shingles. Several mobile homes were damaged. EF2 NE of Springfield Effingham 32°28′N 81°13′W﻿ / ﻿32.47°N 81.22°W﻿ / 32.47; -81.22﻿ (Springfield, GA) 0134 2.5 miles (4.0 km) Over 40 houses were damaged, and three mobile homes and many outbuildings, barns and sheds were destroyed. Power transmission towers were also knocked down. Six people were injured, both in vehicles and mobile homes. EF2 NE of Rincon Effingham 32°18′N 81°14′W﻿ / ﻿32.30°N 81.24°W﻿ / 32.30; -81.24﻿ (Rincon, GA) 0144 0.5 miles (800 m) Tornado impacted the McIntosh Plant of Georgia Power, where several buildings were destroyed. EF0 Due West Abbeville 34°20′N 82°23′W﻿ / ﻿34.33°N 82.39°W﻿ / 34.33; -82.39﻿ (Due West, SC) 1950 1 mile (1.6 km) Tornado reported by a local sheriff with trees damaged. EF0 N of Bucklick Fairfield, Kershaw 34°16′N 80°29′W﻿ / ﻿34.27°N 80.49°W﻿ / 34.27; -80.49﻿ (Bucklick, SC) 2010 25 miles (40 km) Long track tornado with tree damage. EF3 Prosperity area Newberry, Richland 34°15′N 81°32′W﻿ / ﻿34.25°N 81.53°W﻿ / 34.25; -81.53﻿ (Prosperity, SC) 2025 28 miles (45 km) Many houses sustained major damage and mobile homes were destroyed. Two people were injured. EF1 Lugoff area (1st tornado) Kershaw 34°14′N 80°38′W﻿ / ﻿34.23°N 80.63°W﻿ / 34.23; -80.63﻿ (Lugoff, SC) 2030 23 miles (37 km) Numerous houses and mobile homes damaged and trees down. EF0 SE of Angelus Chesterfield 34°20′N 80°01′W﻿ / ﻿34.33°N 80.01°W﻿ / 34.33; -80.01﻿ (Angelus, SC) 2047 7 miles (11 km) Long track tornado with tree damage. EF1 McCormick area McCormick, Edgefield 33°55′N 82°24′W﻿ / ﻿33.91°N 82.40°W﻿ / 33.91; -82.40﻿ (McCormick, SC) 2102 24 miles (39 km) Long track tornado with intermittent light to moderate damage, affecting numerous houses and mobile homes. EF2 Elgin area Kershaw 34°06′N 80°27′W﻿ / ﻿34.10°N 80.45°W﻿ / 34.10; -80.45﻿ (Elgin, SC) 2122 7 miles (11 km) Large wedge tornado tore through town damaging many houses and destroying four mobile homes. Two people were injured. EF1 SW of Ward Saluda 33°31′N 81°28′W﻿ / ﻿33.51°N 81.47°W﻿ / 33.51; -81.47﻿ (Ward, SC) 2124 3 miles (4.8 km) Major damage to one house and many trees knocked down. EF0 Lugoff area (2nd tornado) Kershaw 34°08′N 80°24′W﻿ / ﻿34.13°N 80.40°W﻿ / 34.13; -80.40﻿ (Lugoff, SC) 2133 1 mile (1.6 km) Brief tornado touchdown. EF0 SE of Monetta Aiken 33°29′N 81°20′W﻿ / ﻿33.49°N 81.34°W﻿ / 33.49; -81.34﻿ (Monetta, SC) 2137 1 mile (1.6 km) Brief tornado touchdown knocked down trees. EF1 Pelion area Lexington 33°29′N 81°12′W﻿ / ﻿33.48°N 81.20°W﻿ / 33.48; -81.20﻿ (Pelion, SC) 2141 8 miles (13 km) One mobile home was heavily damaged and farm equipment was damaged. EF1 E of Sharp Richland 34°06′N 80°32′W﻿ / ﻿34.10°N 80.53°W﻿ / 34.10; -80.53﻿ (Sharp, SC) 2143 4 miles (6.4 km) Significant damage in the Lake Carolina area with homes damaged and trees knocked down, especially near Columbia Country Club. EF0 Latta Dillon 34°20′N 79°26′W﻿ / ﻿34.34°N 79.43°W﻿ / 34.34; -79.43﻿ (Latta, SC) 2148 1.2 miles (1.9 km) Minor damage to seven houses, some of which was caused by fallen trees. EF1 N of Wolfton Orangeburg, Calhoun 33°23′N 81°01′W﻿ / ﻿33.38°N 81.01°W﻿ / 33.38; -81.01﻿ (Wolfton, SC) 2205 21 miles (34 km) Several houses and barns were damaged and outbuildings were destroyed. Tree damage reported in the area. EF0 N of Pleasant Lane Edgefield 33°15′N 81°17′W﻿ / ﻿33.25°N 81.29°W﻿ / 33.25; -81.29﻿ (Pleasant Lane, SC) 2211 4 miles (6.4 km) Trees down in a heavily forested area. EF2 Clearwater area Aiken 33°15′N 81°17′W﻿ / ﻿33.25°N 81.29°W﻿ / 33.25; -81.29﻿ (Clearwater, SC) 2218 25 miles (40 km) Large wedge tornado up to 1 mile (1.6 km) wide destroyed a water tower and heavily damaged many houses. EF1 S of Florence Florence 34°07′N 79°47′W﻿ / ﻿34.12°N 79.78°W﻿ / 34.12; -79.78﻿ (Florence, SC) 2225 14 miles (23 km) Over 80 houses were damaged and about 10 trailers were rolled. At least 16 were also impacted. Three people suffered minor injuries and two livestock were killed. EF0 W of Williston Barnwell 33°15′N 81°17′W﻿ / ﻿33.25°N 81.28°W﻿ / 33.25; -81.28﻿ (Williston, SC) 2247 unknown Brief tornado touchdown with no damage. EF1 S of Ashwood Lee 34°04′N 80°09′W﻿ / ﻿34.06°N 80.15°W﻿ / 34.06; -80.15﻿ (Ashwood, SC) 2252 14 miles (23 km) Several houses, mobile homes and a church were damaged. EF0 E of Elko Barnwell 33°13′N 81°13′W﻿ / ﻿33.22°N 81.21°W﻿ / 33.22; -81.21﻿ (Elko, SC) 2254 unknown Brief tornado touchdown with no damage. EF0 S of Manning Clarendon 33°19′N 80°04′W﻿ / ﻿33.32°N 80.06°W﻿ / 33.32; -80.06﻿ (Manning, SC) 2302 8 miles (13 km) Tornado tracked along the north shore of Lake Marion. Minor damage to several houses. EF1 SE of Denmark Bamberg 34°04′N 80°09′W﻿ / ﻿34.06°N 80.15°W﻿ / 34.06; -80.15﻿ (Denmark, SC) 2305 2 miles (3.2 km) Several houses sustained moderate damage, and power poles were knocked down. EF0 Aynor Horry 33°55′N 79°10′W﻿ / ﻿33.92°N 79.16°W﻿ / 33.92; -79.16﻿ (Aynor, SC) 2313 0.25 miles (400 m) A mobile home and a car port were destroyed, which also damaged trees and power lines. EF1 S of Greeleyville Williamsburg 33°34′N 79°59′W﻿ / ﻿33.56°N 79.99°W﻿ / 33.56; -79.99﻿ (Greeleyville, SC) 2317 1.5 miles (2.4 km) One house was damaged and a church steeple was toppled. Extensive tree damage. EF3 Branchville area Bamberg, Orangeburg 33°15′N 80°49′W﻿ / ﻿33.25°N 80.82°W﻿ / 33.25; -80.82﻿ (Branchville, SC) 2325 14 miles (23 km) Widespread damage in the area from a large wedge tornado with 17 houses damaged or destroyed. Many downtown buildings and a fire station were also damaged or destroyed in Branchville. EF1 Trio Williamsburg 33°29′N 79°43′W﻿ / ﻿33.48°N 79.72°W﻿ / 33.48; -79.72﻿ (Trio, SC) 2336 3 miles (4.8 km) A total of 35 houses were damaged, of which one was destroyed. EF1 SW of Oakland Georgetown 33°17′N 79°13′W﻿ / ﻿33.28°N 79.22°W﻿ / 33.28; -79.22﻿ (Oakland, SC) 2354 20 yards (20 m) Very brief tornado blew a few trees onto a house. EF1 N of Ridgeville Dorchester 33°06′N 80°19′W﻿ / ﻿33.10°N 80.32°W﻿ / 33.10; -80.32﻿ (Ridgeville, SC) 0008 2.2 miles (3.5 km) Rope tornado with metal panels removed from a gas station canopy. Two mobile homes were also heavily damaged. EF1 Strawberry Berkeley 33°05′N 80°02′W﻿ / ﻿33.09°N 80.03°W﻿ / 33.09; -80.03﻿ (Strawberry, SC) 0025 0.6 miles (970 m) Heavy damage to a mobile home park with 14 mobile homes impacted. Seven people were injured. EF1 N of Charity Berkeley 33°03′N 79°51′W﻿ / ﻿33.05°N 79.85°W﻿ / 33.05; -79.85﻿ (Charity, SC) 0036 1.2 miles (1.9 km) Roofs were damaged on a church and a house. Many trees were knocked down. EF0 Fair Bluff Columbus 34°19′N 79°02′W﻿ / ﻿34.31°N 79.03°W﻿ / 34.31; -79.03﻿ (Fair Bluff, NC) 2210 30 yards (27 m) Very short-lived tornado damaging a few trees amidst straight-line wind damage. EF1 Hampstead Pender 34°22′N 77°42′W﻿ / ﻿34.37°N 77.70°W﻿ / 34.37; -77.70﻿ (Hampstead, NC) 2356 2 miles (3.2 km) Several houses and businesses were damaged in the area. CNN Center was severely damaged, including shattered windows. The Georgia World Congress Center also sustained serious damage, as was the Omni Hotel, especially the skywalk between the two hotel towers over Andrew Young International Boulevard. This complex alone lost 476 windows, making it necessary to close the south tower to guests. The facades of the Georgia Dome and a Philips Arena parking garage were damaged while hosting basketball games. Two of the giant columns in Centennial Olympic Park were knocked down, and insulation was stuck in trees. Trees on some other streets were blown completely down, despite being too early in spring to involve leaf drag. Glass was strewn across several streets, and Atlanta Police kept residents, hotel guests, and news crews away from buildings with falling glass, which continued to pose a danger into the night. Cars in the area were also damaged, and hotel and office furniture was found scattered about. The Ritz Carlton, Westin Peachtree Plaza, Georgia-Pacific Building, SunTrust Plaza (where more than 60 people had to be relocated out of their offices), Equitable Building, and Georgia State University also had windows blown out (300 at Equitable alone), as did The Tabernacle (a former church with stained glass that is now a concert venue). The windows of the Westin continued to fall for days after the tornado, forcing police to keep several city blocks and MARTA's Peachtree Center station closed to pedestrians. The Georgia World Congress Center also sustained flooding while hosting a JROTC event and the Hinman Dental Meeting; Fox Sports Net took footage of a staircase in the new section of the complex that looked like a fountain with water cascading down it. The annual Atlanta Home Show and all other events were cancelled for the weekend in the GWCC complex, as was the Atlanta St. Patrick's Day Parade scheduled for the next day. WRAS FM at Georgia State University was off the air for two days, though it was not stated whether its studio or tower sustained damage, or if this was due to security or safety concerns, or power outages. The historic Rialto Theatre at GSU also sustained roof damage, which caused water damage inside. Further east, Grady Hospital reported some damage to windows and a power outage. Many of the injured were taken there, and some walked there and were treated in the emergency room for cuts due to glass. The King Memorial MARTA station was damaged and was being bypassed by trains, with buses rerouted to the next station on each side. Oakland Cemetery suffered major damage to monuments and to its huge oaks and magnolias, and the caretaker found window blinds around the neck of a statue of a Civil War veteran buried there. A 100-year-old Water oak tree crushes a GMC van in the North Ormewood Park neighborhood. Tree uprooted in the Cabbagetown neighborhood, taking most of the yard with it. In the nearby Cabbagetown area, a brick loft building (well known for the fire that occurred there in 1999, during its renovation from the Fulton Bag and Cotton Mills, in which the crane operator was rescued by helicopter during live TV news coverage) lost part of its roof, and part of the top (fifth) floor. Another building at The Stacks on Boulevard was damaged; search and rescue personnel were unable to enter, but everyone was accounted for by the management within a few hours. When the tornado hit, a SEC tournament game between Mississippi State and Alabama which had just been sent into overtime minutes earlier by a shot from Mykal Riley, was in progress at the Georgia Dome and being broadcast live on television. The storm ripped panels from the exterior of the building and tore two holes in the roof of the Dome, causing insulation to fall and the scoreboard and catwalks suspended from the roof to sway; much of this was captured on camera, though the transmission from the arena was interrupted. Mykal Riley's shot was considered to have saved lives by keeping people safe inside the Georgia Dome. After a 64-minute delay, the game was completed, however the next scheduled game between Kentucky and Georgia was postponed. The remainder of the tournament games were played at Alexander Memorial Coliseum on the campus of Georgia Tech, with spectators restricted to team and conference personnel, media, team bands, and families of players only due to the much smaller size of the alternate venue. At the nearby Philips Arena, little disruption was noticed by the attendees during the game between the Hawks and the Los Angeles Clippers, even though damage occurred to the outside of the arena. Twenty-seven people were treated for injuries. In addition, over 20 homes were completely destroyed. All of CNN's TV networks remained on the air, but there was damage to the glass roof of the CNN Center atrium, flooding part of the food court. Additionally, blown-out windows in the ground floor CNN.com newsroom and the fourth floor videotape library caused minor damage. Live news coverage of the aftermath was carried on CNN International, in turn simulcast domestically on CNN until 1 am EDT. CNN resumed broadcasting from their main newsroom at 6 am EDT, showing several parts of the newsroom with computer stations covered with tarps, the damaged atrium of CNN Center, and staff using trash cans and buckets to collect dripping rainwater to the right of the anchor desk due to the damaged roof. When more storms moved in later in the day, the network was forced to move all Atlanta on-camera operations to the windowless CNN-I studio, while taped programming was shown for most of the day. The city received emergency assistance from the Georgia Emergency Management Agency (GEMA), Highway Emergency Response Operators (HEROs), Fulton and DeKalb counties (where Atlanta is situated), and surrounding cities and counties. Atlanta Mayor Shirley Franklin also declared a state of emergency for the city  and Governor Sonny Perdue issued a state state of emergency declaration  for Atlanta enabling the city to seek disaster aid from the Federal Emergency Management Agency (FEMA). President Bush declared a major disaster on March 20. In raw U.S. dollars, it was the most expensive tornado in American history after the 1999 Oklahoma City tornado, costing a half-billion dollars. When adjusted for inflation, it ranks ninth. Wikimedia Commons has media related to 2008 Atlanta tornado outbreak. ^ "Tornado slams downtown Atlanta". CNN. March 14, 2008. Archived from the original on 15 March 2008. Retrieved 2008-03-14. ^ "Friday tornado pummels downtown; Saturday storm kills 2". Atlanta Journal-Constitution. March 15, 2008. Archived from the original on 9 March 2009. Retrieved 2009-04-19. ^ Dial (March 14, 2008). "Mar 15, 2008 0100 UTC Day 1 Convective Outlook". Storm Prediction Center. Retrieved 2008-03-14. ^ Dial, Grams (March 15, 2008). "Mar 15, 2008 0600 UTC Day 1 Convective Outlook". Storm Prediction Center. Retrieved 2008-03-16. ^ Broyles (March 15, 2008). "Mar 15, 2008 2000 UTC Day 1 Convective Outlook". Storm Prediction Center. Retrieved 2008-03-16. ^ "SPC Day 1, 2 and 3 Convective Outlooks". Storm Prediction Center. February 14, 2006. Archived from the original on 2008-05-09. Retrieved 2008-03-16. ^ a b "Storm Staggers Atlanta". CNN.com. March 14, 2008. Archived from the original on 15 March 2008. Retrieved 2008-03-15. ^ "Atlanta tornado, victim search". WCBD.com. March 15, 2008. Retrieved 2008-03-15. ^ Schlabach, Mark (March 14, 2008). "SEC tournament delayed as Georgia Dome sustains damage". ESPN.com. Archived from the original on 19 March 2008. Retrieved 15 March 2008. ^ "Severe Storms Start Weekend". AccuWeather.com. March 15, 2008. Archived from the original on 14 March 2008. Retrieved 2008-03-15. ^ a b "Weather Service Confirms Tornado Hit Downtown Atlanta". WSB-TV (Atlanta). March 15, 2008. Archived from the original on 18 March 2008. Retrieved 2008-03-15. ^ "Rescuers search for Atlanta tornado victims". CNN. March 15, 2008. Archived from the original on 19 March 2008. Retrieved 2008-03-15. ^ "Atlanta To Ask For Federal Disaster Aid". wsbtv.com. March 14, 2008. Archived from the original on 18 March 2008. Retrieved 2008-03-15. ^ "CNN & The F2 Tornado - TVNewser". 10 September 2012. Archived from the original on 10 September 2012. Retrieved 18 May 2018. ^ "Governor Perdue Declares State of Emergency". State of Georgia, Office of the Governor. March 15, 2008. Archived from the original on May 28, 2010. Retrieved 2009-12-14. ^ "Search | Atlanta Creative Loafing". Blogs.creativeloafing.com. Retrieved 2018-05-18. ^ "10 Costliest U.S. Tornadoes". www.spc.noaa.gov. Retrieved 18 May 2018.